Burnley suffered a cruel defeat at Turf Moor as Arsenal secured victory with a controversial Laurent Koscielny goal in the final act of an intriguing match. In added time, Theo Walcott headed across goal towards Alex Oxlade-Chamberlain whose effort went in off what appeared to be Koscielny's elbow. As well as a possible handball, there was also a hint of offside with captain Koscielny standing on the goalline. Michael Keane had Burnley's best chance, heading on to the crossbar. But despite the Clarets' fine defensive display, with Keane in particular impressing as they shut out Arsenal until the 94th minute, they came away with no points for their efforts. The win allowed Arsenal to close the gap on league leaders Manchester City, who lost 2-0 at Tottenham in one of Sunday's earlier kick-offs, to two points while overtaking Liverpool to claim third place. Manager Arsene Wenger admitted his team were fortunate in victory but with this result at Turf Moor, and convincing victories over Chelsea in the league and Basel in the Champions League in the last week, the north Londoners have hit a fine run of form, extending their unbeaten stretch to six league games. Immediately after the match, Koscielny - who was credited with the goal - said he did not know whether he had handled. "I tried with my right foot and I don't know if I touch it with my hand," the Frenchman said. Even though Burnley did not appeal for handball at the time, their manager Sean Dyche said afterwards the ball "quite clearly" hit the defender's hand. To add to the confusion Arsenal's winner caused, Oxlade-Chamberlain celebrated as if he had scored but the England international's shot did appear to hit Koscielny's arm before it crossed the line, while Dyche even suggested that it was the Arsenal captain who kicked the ball on to his own arm. As another caveat, if it were the case that Oxlade-Chamberlain did kick the ball on to Koscielny's arm, the defender would have been in an offside position. "You have to question the added time, the corner and whether it should have come in, the handball and question whether we should have dealt with it," added Dyche. "It's a poor way to end a game." But no matter what the theories or Dyche's thoughts, referee Craig Pawson saw nothing wrong with the winner which secured Arsenal a fifth successive Premier League win and ensured another win for Wenger as the 21st year of the 66-year-old's reign began. This graphic shows how Arsenal's winner unfolded, with Theo Walcot (14) heading a Mesut Ozil (11) corner across goal and cue chaos. Arsenal were their usual selves in possession - accurate and dominant - but their pleasing-on-the-eye play would often break down as soon as they closed in on the Burnley box, in the first half especially. The visitors had just one shot on target before the break - a trifling Mesut Ozil attempt in the 16th minute - and so organised were Burnley in defence, it quickly became clear why Dyche's side had conceded only five goals in their last 17 league games at home before this match. Ozil was as disappointing as he was effervescent in the 3-0 win over Chelsea, his game summed up with a wayward shot which sailed into the stands when there were better options available to him. Wenger admitted his team were jaded after three matches in eight days. "We lacked sharpness and our legs were heavy and that was a game we could win 1-0 and also lose 1-0 on set-pieces," the Frenchman said. As the match progressed, the Gunners threatened more with Alexis Sanchez their most dangerous player, forcing a low save from goalkeeper Tom Heaton and then striking the bottom corner of the post after Burnley had failed to deal with an Ozil cross. Eight points from their opening seven league games is a decent start for the newly promoted side, but that will not mask the disappointment of losing in such a manner on what was their fifth home game of the season. The hosts went into the break wondering what could have been, with Sam Vokes squandering the best chance of the half as the Wales international - unmarked six yards from goal - headed Matt Lowton's chipped cross wide when he had only Petr Cech to beat, and that is how they also ended the match. Dyche's men had to wait until the 60th minute for their first and only shot on target. Johann Berg Gudmundsson out-jumped Koscielny to scare Cech with his header, while moments later Walcott was forced to scramble Vokes' header clear to prevent a second chance from opening up for Gudmundsson. While Burnley deserved at least a draw, their profligacy in front of goal, as well as their failure to hit the target - they have only managed 16 shots on target in the league this season - is concerning. He was on the losing side, but defender Keane not only marshalled Burnley's defence expertly - making six clearances and two blocks - but also came agonisingly close to scoring late in the second half. 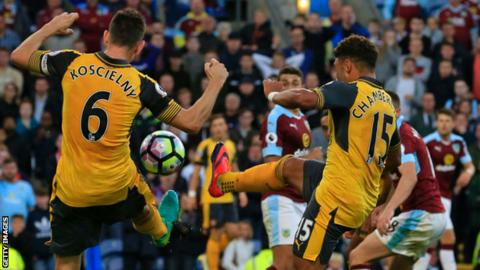 Burnley are winless in eight league games against the Gunners (D3 L5), losing each of the last four in the Premier League. Only Liverpool (28) have scored more 90th-minute winning goals in the Premier League than Arsenal (23). Arsenal have won five successive Premier League games for the first time since October 2015, and kept back-to-back clean sheets for the first time this season. Neither Burnley nor Arsenal have scored more than one goal at Turf Moor in their last four league meetings (0-0, 1-1, 0-1 and 0-1). Burnley have scored just five goals in their opening seven Premier League games; the joint-fewest in the competition so far (along with Stoke). Only Hull City (93) have faced more shots (including blocks) than Burnley (84) at home in the Premier League this season, despite the Clarets conceding just three times at Turf Moor. The international break means Arsenal's next match - at home to struggling Swansea - will not be until 15 October. Meanwhile Burnley, 14th in the league, face a tough trip to Southampton on 16 October. Match ends, Burnley 0, Arsenal 1. Second Half ends, Burnley 0, Arsenal 1. Goal! Burnley 0, Arsenal 1. Laurent Koscielny (Arsenal) right footed shot from very close range to the bottom left corner. Assisted by Theo Walcott with a headed pass following a corner. Corner, Arsenal. Conceded by Jeff Hendrick. Attempt blocked. Alex Oxlade-Chamberlain (Arsenal) right footed shot from the centre of the box is blocked. Assisted by Alexis Sánchez. Corner, Arsenal. Conceded by Michael Keane. Attempt blocked. Alexis Sánchez (Arsenal) right footed shot from the right side of the box is blocked. Assisted by Mesut Özil. Attempt blocked. Theo Walcott (Arsenal) right footed shot from outside the box is blocked. Assisted by Santiago Cazorla. Offside, Burnley. Tom Heaton tries a through ball, but Sam Vokes is caught offside. Attempt missed. Theo Walcott (Arsenal) right footed shot from outside the box is close, but misses to the right. Assisted by Alexis Sánchez. Attempt missed. Sam Vokes (Burnley) header from the centre of the box misses to the right. Assisted by Scott Arfield with a cross following a corner. Michael Keane (Burnley) hits the bar with a header from the centre of the box. Assisted by Johann Berg Gudmundsson with a cross following a corner. Corner, Burnley. Conceded by Mohamed Elneny. Alexis Sánchez (Arsenal) hits the right post with a right footed shot from the centre of the box following a corner. Attempt blocked. Mohamed Elneny (Arsenal) right footed shot from the centre of the box is blocked. Assisted by Santiago Cazorla. Attempt missed. Theo Walcott (Arsenal) right footed shot from the right side of the box misses to the left. Assisted by Alexis Sánchez. Attempt missed. Mesut Özil (Arsenal) left footed shot from the left side of the box is high and wide to the left. Assisted by Alexis Sánchez. Substitution, Burnley. Scott Arfield replaces Steven Defour. Attempt missed. Sam Vokes (Burnley) header from the centre of the box misses to the right. Assisted by Steven Defour with a cross following a corner. Corner, Burnley. Conceded by Petr Cech. Attempt saved. Johann Berg Gudmundsson (Burnley) header from the centre of the box is saved in the bottom left corner. Assisted by Stephen Ward with a cross. Attempt blocked. Mesut Özil (Arsenal) left footed shot from the centre of the box is blocked. Assisted by Alexis Sánchez. Attempt missed. Alex Iwobi (Arsenal) right footed shot from the left side of the box misses to the right. Assisted by Alexis Sánchez. Attempt missed. Jeff Hendrick (Burnley) right footed shot from outside the box is too high. Assisted by Steven Defour. Attempt missed. Theo Walcott (Arsenal) right footed shot from outside the box is high and wide to the right. Assisted by Alexis Sánchez. Attempt blocked. Johann Berg Gudmundsson (Burnley) left footed shot from outside the box is blocked. Assisted by Jeff Hendrick. Attempt saved. Alexis Sánchez (Arsenal) right footed shot from the centre of the box is saved in the bottom right corner. Assisted by Héctor Bellerín. Second Half begins Burnley 0, Arsenal 0. First Half ends, Burnley 0, Arsenal 0.